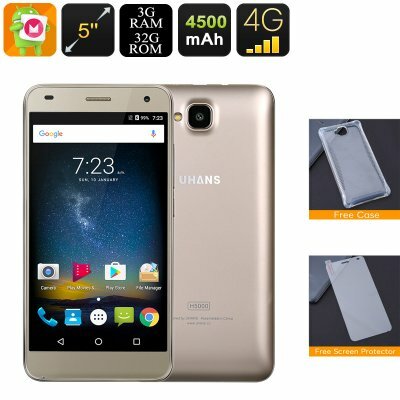 Successfully Added Android Phone Uhans H5000 - 5 Inch IPS Display, 720P, Dual-IMEI, 4G, Android 6.0, Quad-Core CPU, 3GB RAM, 4500mAh (Gold) to your Shopping Cart. The Uhans H5000 is a cheap Android phone that, despite its affordable price, comes packed with top notch hardware. Within its body, this Android smartphone holds a sophisticated Quad-Core CPU that reaches clock speeds up to 1.2GHz. With all this power at hand, you’ll be able to effortlessly enjoy games, watch movies, and use demanding Android applications. Additionally, the mobile phone packs 3GB of RAM that delivers a speedy performance even when using multiple of the phone’s features simultaneously. No matter what you throw at this beautiful Android phone, the Uhans H500 is guaranteed to handle it with ease. On its beautiful 5 Inch HD display, this Android smartphone brings forth breathtaking visuals in crisp 720p resolution. Thanks to its IPS technology, the phone treats you with high details and vivid color – allowing you to take the absolute most out of all your favorite media. This Android phone furthermore comes with Google Play installed, thus providing you with unlimited access to free mobile games and applications to enjoy on its stunning display. With up to 64GB of external storage space available, this cheap android phone holds enough storage for you to keep all your files and media alike. Besides its powerful hardware, this Android smartphone comes with the Android 6.0 operating system. Allowing you to use the latest Android features and applications, this mobile phone is guaranteed to deliver a smooth and efficient user experience. It furthermore comes with Dual-IMEI numbers and 4G support to fully enhance your mobile connectivity on the go. Thanks to its 4500mAh battery, you’ll be able to head out with confidence as there will be no worries what so ever about running out of juice throughout the day. For all smartphone photography lovers out there, this Android phone features an 8MP rear camera that lets you shoot beautiful images at both day and night. Allowing you to shoot HD video, this camera furthermore gives you all means necessary to capture all those great memories in great detail. Additionally, this Android smartphone comes with a 5MP front snapper that brings along tons of possibilities for online video calls and the selfie lovers among us.